If 'settlers' keep trying to 'invade' the Temple Mount, radical Arab MK asserts, 'resistance' will continue. Radical MK Hanin Zoabi (Joint List) stressed Tuesday that Arab "resistance" to Jewish activity on the Temple Mount will continue, while also hinting that Israel's policies paralleled the Nazi regime. "It's rude and bullying to compare the demand to defend Muslims' right to pray at their holy sight to the Nazi regime. Everyone knows who is closer to the Nazi regime - MK Hanin Zoabi or the State of Israel and Minister [Ze'ev] Elkin," Zoabi told Army Radio. "Every time there is an invasion - and this is an invasion and not a right - of settlers, extremists and police, there will be resistance." 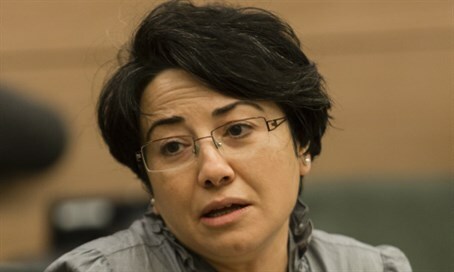 Zoabi's incendiary remarks come after a frenzy of condemnation following the publication of footage of MK Jamal Zahalka (Joint List) berating Israeli police over allowing Jewish visitors to the Temple Mount. Absorption Minister Ze'ev Elkin (Likud) quickly responded to Zoabi's attack, blasting her outrageous logic. "According to Hanin Zoabi, the ideology that there must be places clean of a Jewish presence - like what occurred during the infamous period of World War II - is a widespread, normal opinion," Elkin charged. "If, God forbid, Jews ascend to the Temple Mount, it is so terrible that we should go wild in response. If police ascend to create order, then they are the ones who are guilty," he added, sarcastically.